When you play at an online casino you can't exactly chat with the person at the next slot machine like you can in Vegas. But it seems that social media is giving online players a chance to congratulate each other on good luck and sympathize with those that are between wins. 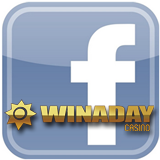 The WinADay Casino Facebook Page has become an important part of the casino experience for many players at WinADay Casino. One day during the final week of its $500,000 birthday bash last month, WinADay welcomed its 3000th Facebook Friend. To celebrate, the unique instant play casino is running another Facebook contest. Everyone that responds to the question now on the Facebook Page about the new Pacific Victory penny slot will be entered in a random draw for a $50 casino credit. The winner will be announced on Facebook August 4th. WinADay now has dozens of truly unique slots as well as Roulette and Keno. Its penny slots also have versions enhanced for iPhones, iPads and Android phones and tablets.